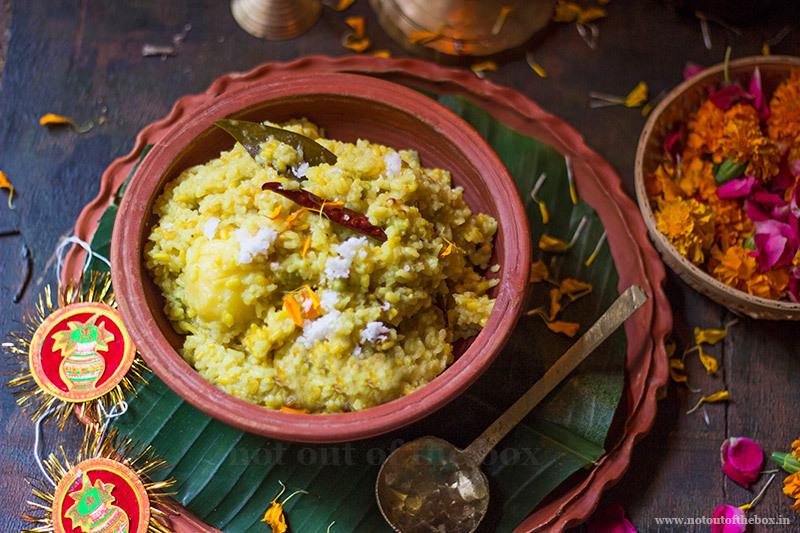 In Bengal Bhoger Khichuri is a common part of Naivedya, which is an essential phase of Hindu worshipping where devotees offer various food to Deity. 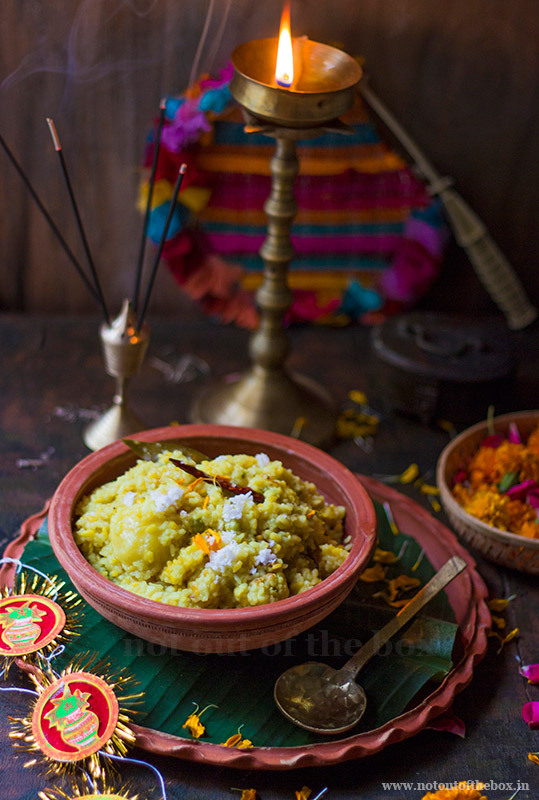 Khichuri bhog is the most prevalent bhog as it’s distributed largely to the devotees. This rather satisfying bhog gets its authentic flavour from two important ingredients — Gobindobhog chaal (rice) and Sona moong dal. 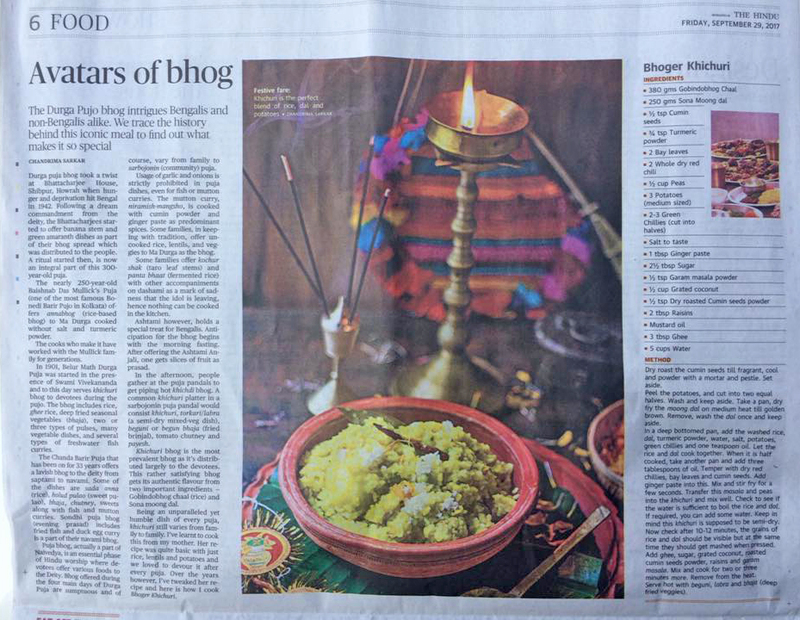 I’ve written an article about Bhog recently, and that published by The Hindu with this recipe. Being an unparalleled yet humble dish of every puja, khichuri still varies from family to family. I’ve learnt to cook this from my mother. Her recipe was quite basic with just rice, lentils and potatoes and we loved to devour it after every puja. Over the years however, I’ve tweaked her recipe and here is how I cook Bhoger Khichuri. To make the dry roasted Cumin seeds powder, dry roast 1 tsp of cumin seeds in a frying pan until fragrant. Grind them to a powder by using the mortar and pestle. Keep aside. Peel the potatoes, and cut into two equal halves. Wash and keep aside. Take a pan, dry fry the moong dal on medium heat until golden brown. Remove, wash the dal once and keep aside. In a deep bottomed pan, put the washed rice, dal, turmeric powder, water, salt, potatoes, green chillies and 1tsp oil. Let the rice and dal cook together. When it is half cooked, take another pan and add 3 tbsp oil. Temper with dry red chillies, bay leaves and cumin seeds. Add ginger paste into this. Mix and stir fry for a few seconds. Transfer this masala and peas into the khichuri and mix well. Check to see if the water is sufficient to boil the rice and dal. If require, you can add some water. Keep in mind this khichuri is supposed to be semi-dry. Now check after 10-12 minutes, the grains of rice and dal should be visible but at the same time they should get mashed when pressed. Add ghee, sugar, grated coconut, roasted cumin seeds powder, raisins and garam masala powder. Mix and cook for 2-3 minutes more. Remove from the heat. Serve hot with Beguni, Labra and Bhaja (deep fried veggies). Loved reading your article. Wonderful write up Chandrima!